Windows 7 has been around for some time now and our stats are showing huge increase of Windows 7 use amongst our users, over half of you are using it right now. As a result, our driver scanning has gotten a lot more accurate, we are now truly the easiest way to update your Windows 7 drivers. 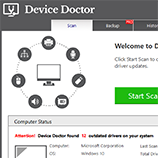 If you haven't already, give it a try - download the free Device Doctor and scan your Windows 7 drivers. We thought it would be helpful to compile a list of direct download links to the top Windows 7 driver requests coming into our servers since the Win7 launch. We'll continue to update this list as we get a chance to analyze the server requests - this list was last updated in February 2012.